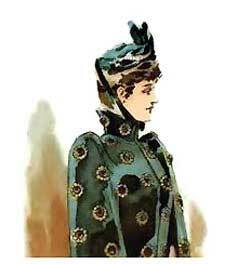 Showcased are elegant examples of outerwear for the fashion-conscious woman in 1891. Featured are Victorian coats, capes and jackets made from exotic furs and expensive fabrics. Stylish hats are trimmed with velvet, feathers, jet, and fur. The garments ranged in price from $75 to $275, quite an expense for the era. Read full story.